We are experiencing a continued shift in the construction industry towards using materials from more sustainable sources. 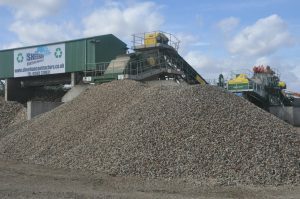 The use of recycled aggregates in Oxfordshire is increasing, due both to the environmental and economic benefits of the product. By using recycled aggregate contractors help the environment by conserving primary aggregates and saving waste material being sent to landfill. Additionally, local waste that is processed via a recycling process and sold locally reduces the need for transportation. This further benefits the environment and reduces costs, meaning savings can be passed onto contractors. We produce high-grade recycled aggregate via our advanced construction and demolition waste recycling system in Oxfordshire. Via the CDE system we process construction, demolition and excavation waste materials via wet processing to produce a superior range of certified sand and aggregates. In the first six-years of operation we have saved 600,000 tonnes of waste from landfill via the plant. Subject to planning consent there is scope to increase the capacity further in the future. The products we created are derived from local waste and used in concrete products for construction projects in the local area. It is this Circular Driven Economy that is crucial to the long-term sustainability of the planet and the construction industry. 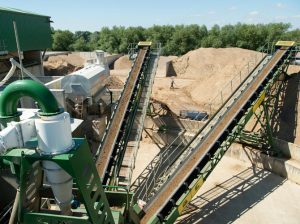 The recycling plant includes a feed system, AggMax portable logwasher, Infinity screens and Evowash sand washing plant. In addition, the system employs full closed-circuit water recycling with the inclusion of the Aquacycle thickener and Filter Press. All the water used is naturally sourced and recycled. The recycled aggregate and sand we produce in Oxfordshire is first class. We have used it in numerous high-end developments at stately homes and University of Oxford buildings via John Sheehan (Oxford) Ltd, our civil engineering company. We are proud to produce recycled aggregate, recycled sand and concrete blocks in Oxfordshire that are of premium quality, environmentally friendly and value for money.